Some friends and I met up for much-needed but all-too-brief weekend getaway in Hot Springs, VA last week and one of our favorite things to do down there is family-style meals. B and I have finally learned (after too many mishaps) to not try to execute meals that are too complication while simultaneously entertaining. 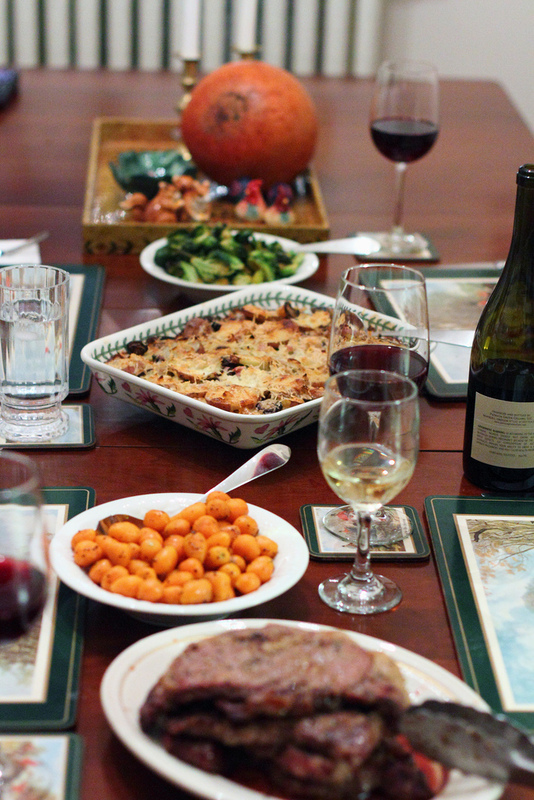 Scalloped potatoes is one of my favorite dishes, but it can be work-intensive. I recently found an easier version that incorporated mushrooms and was pleasantly surprised to find it was just as delicious as my more traditional go-to recipe. Heat a large frying pan and add the butter. When it has melted, add the mushrooms and fry until lightly browned. Stir in the thyme and remove from heat. Pour the cream into a small saucepan and heat very gently with the garlic. Turn off the heat and leave to infuse while you cut the potatoes into thin slices (I didn’t peel them, but you can if you like). 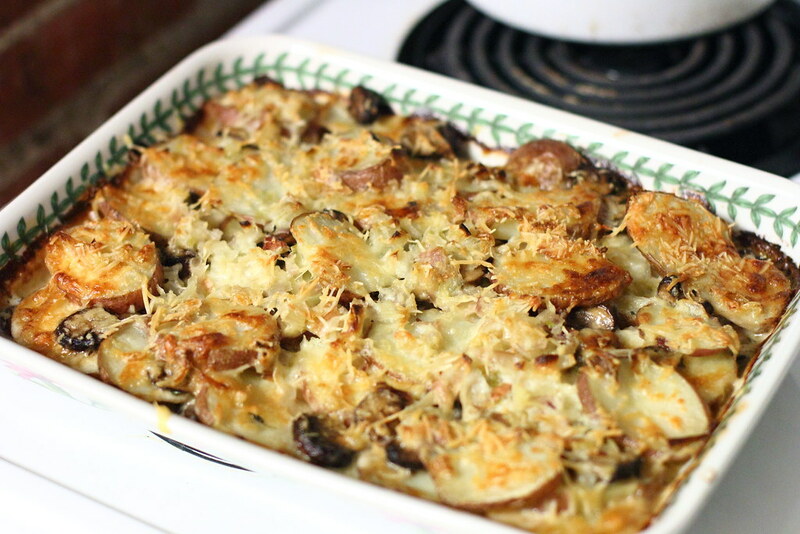 In a buttered, ovenproof baking dish, arrange a layer of potatoes, then half of the mushrooms. Sprinkle over half of the Gruyere cheese and season with salt and pepper. Add another layer of potatoes, top with the remaining mushrooms and Gruyere and season again. Pour over the infused cream, distributing evenly over the dish. Sprinkle the top with the Parmesan. Chop a small slice of butter into little pieces and sprinkle over the top. Bake in the preheated oven for an hour to an hour and 15 minutes until the top is browned and the potatoes thoroughly cooked. Leave to rest 5 minutes before serving. In a small dish, combine first five ingredients into a paste. Pat steaks dry and evenly coat each side with the paste (should be about 1 teaspoon per side). Let sit for 45 minutes (they should be room temperature when you put them on the grill). Cook the steaks medium-rare on oiled medium-high grill, flipping once. Don’t worry if you lose some of the coating. Let rest for 5 minutes after cooking. Serve with extra horseradish on the side if you like. 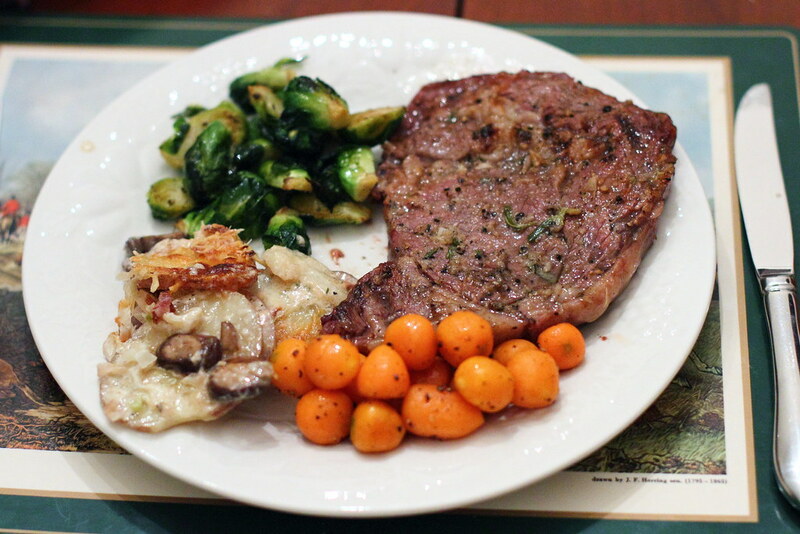 I served the steaks and potatoes with oven-roasted brussels sprouts and carrots that were simply tossed in olive oil and salt and pepper. Wow, what a yummy-looking meal! Talent, girl! Those potatoes look awesome and I have Gruyere. I know what I'm doing this weekend.